But bad on-page SEO can definitely hurt them! But there’s a tool that helps you determine how well your site is doing in a number of the key on-page factors for SEO, and best of all, it’s FREE for up to 500 pages! 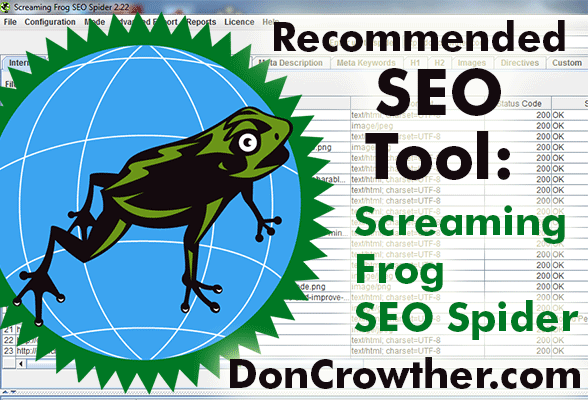 Screaming Frog SEO Spider helps you easily see the data the way the search engines do for each file on your site. With it you can quickly scan to see which pages on your site have problems in certain areas and/or you can probe deeply into individual pages to make sure that everything is in line for that specific page. 1. Go to http://www.screamingfrog.co.uk/seo-spider/ and download a free copy there. It’s available for Windows, Mac, and Ubuntu. 4. When it’s finished, examine your data. 5. (Optional) Run this same scan on some of your top competitors to learn from them! a. Use the filter box about an inch down on the top left to just look at html pages first. That’s where most of your value can be gained. b. Scan for Title 1, fixing the title tag for any pages with missing titles or ineffective ones. I strongly encourage everyone to run this analysis on your site. Frankly, I think you’ll be amazed at how many things need to be fixed. I know I was! Let me know your thoughts on this by leaving a comment below. And don’t forget to like, +1, share, tweet and pin this post!